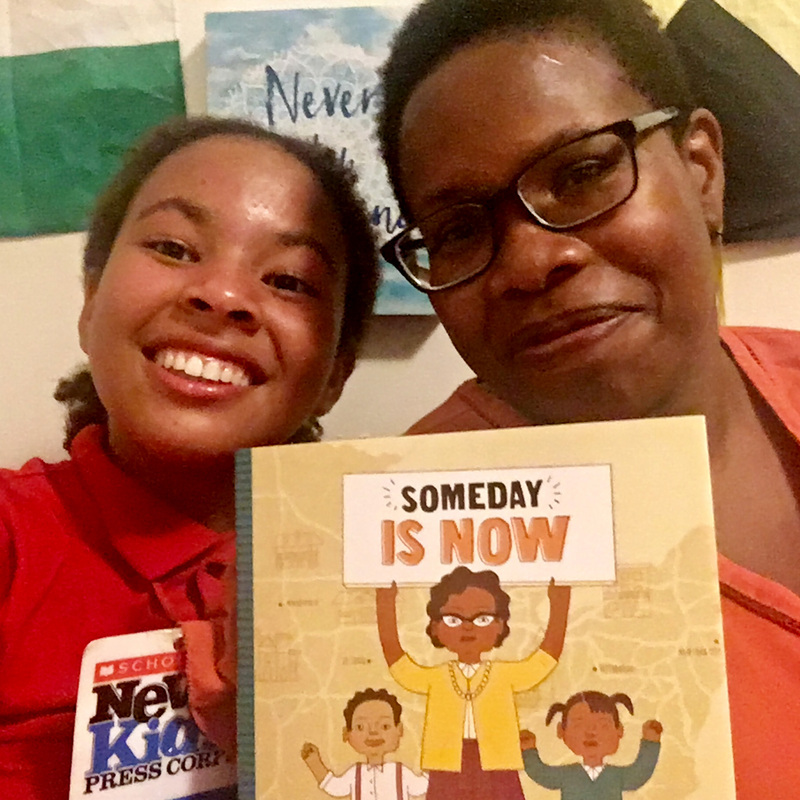 Someday Is Now | Kid Reporters' Notebook | Scholastic Inc.
Have you ever heard the name Clara Luper? Despite her many accomplishments, Luper is not famous. Born in 1923 in Oklahoma, she attended segregated schools and felt the sting of bigotry when she was growing up. She would go on to become an educator and activist, involving her young students in the civil rights movement. A new picture book tells the story of this “unsung heroine.” It’s called Someday Is Now: Clara Luper and the 1958 Oklahoma City Sit-Ins (Seagrass Press, August 2018). The book is written by my mother, Olugbemisola Rhuday-Perkovich, and illustrated by Jade Johnson. What inspired you to write Someday Is Now? I had been working on a book about another activist, Ella Baker. The editorial director of Seagrass Press, Josalyn Moran, saw my work and thought that I might be a good fit for a picture book biography of Clara Luper. When I started doing research, I was amazed at everything that Luper had accomplished. And I was really happy to find out that the illustrator was a Black woman. Jade Johnson’s work is striking, and the color palette she used in this book is so beautiful. All children should know stories like Luper’s. Many of the stories of African Americans that are told are ones that emphasize suffering or portray Black people primarily as victims. Black people in the United States have resisted oppression from the moment they were forced into the system of slavery. We [as a society] also like to hold up narratives of “singular heroes.” The truth is that there were and are many people from all walks of life who sit in, stand up, make change, support, and speak out in the fight against racism. There are activists, artists, writers, scientists, and educators like Luper. We especially ignore or forget the stories of Black women and children who are often the cornerstones of justice movements. The fact that Luper was an educator by profession is so important. Our country doesn’t value teachers the way that it should. Luper’s work shines a light on what so many educators have done and continue to do. It’s also inspiring for readers to see children just like them who made a decision to confront injustice and do something about it. Ordinary people really can do extraordinary things every day. What was it like to speak with Ayanna Najuma, who was one of the youngest children to sit-in with Luper? I was really nervous. Another author friend, Gwendolyn Hooks [Tiny Stitches: The Life of Medical Pioneer Vivien Thomas], who is from Oklahoma, helped me get Najuma’s contact information. It took me a while to contact her because I was scared. But when I did finally talk with her on the phone, it was wonderful. Hearing all of those memories firsthand, knowing that I was speaking with someone who was such an important part of history, was thrilling. What have you learned since your first book? How did you apply that to Someday Is Now? My first book was fiction. Although Someday Is Now is about a slice of real history, I still had to make sure that I told a story, and thought about it that way throughout. I tend to write “long,” and working on a picture book really taught me to be economical with words, to make sure that each word has meaning. It was much harder than a novel for me. I’ve also learned more about how to communicate and collaborate with my editor. This was my first picture book, and I was fortunate because I got to work with an editor [Kevin Lewis, the author of Chugga-Chugga Choo-Choo and other children's books] who is a master of the form. Writing the book with him was like being in a Master Class. What do you hope young readers will learn from Someday Is Now? One thing that is really important about this story is that children made a decision to do something about segregation in their town. They made a prolonged commitment. They educated themselves about the issues and tried different ways of approaching it. Luper trained them in the methods of nonviolent resistance. It’s easy to think of these movements as ad hoc and loosely organized, but that is very far from the truth. The students’ dedication was really inspiring. I hope young readers will see that education and learning are not just about tests or the next academic achievement. Real learning is applied to life, to being thoughtful about what we do, to thinking creatively and imagining and realizing a more just world. I also hope that readers don’t stop at this story, but will go on to explore the countless stories of “hidden figures” in our history. Too often, Black history is seen as a February obligation—a time to repeat stale, simplified stories of Martin Luther King Jr. having only one dream, Rosa Parks just sitting on a bus until she’s dragged off to jail, and Harriet Tubman running. Their stories are so much richer and more complex than that. Plus, there are so many more people and stories. And we have a year-round opportunity to deepen our knowledge of our history and be inspired and motivated for our future. I also hope that young readers will see that they don’t have to wait until “someday” to do something about injustice. Everyone can contribute from wherever they are. Read, read, read. Read whatever you love, and feel free to re-read your favorites. Then, every once in a while, try something you never would have picked out on your own. Find someone or a group of someones you trust to be your writing community. It’s so nice to have people that you can share your work with, learn from, and just talk about books and writing with. Don’t wait to write—someday is now!